In a recent press release, Volvo Trucks has unveiled its first all-electric truck for commercial use - the Volvo FL Electric. This piece of news is but the first in a series of announcements that started in November 2017 with the Tesla Semi, and has since seen other industry players like Daimler, Cummins, and emerging companies like Nikola present the advantages of converting the trucking industry from diesel engines to electric powertrains. By looking at GHG emissions figures, it is immediately clear why the trucking industry can play a pivotal role in their reduction: together with buses, it accounts for about 37% of CO2 emissions in the European Union, despite making up a much smaller proportion of the total road vehicle population. Please see the IDTechEx Research report Electric Vehicles 2018-2038 . Trucks on the road are often 10+ years old, which means that most of those we see on the road do not comply with the newest emissions regulations yet. 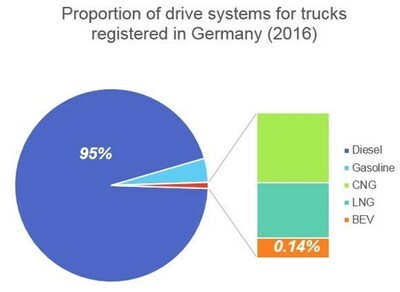 Even environmentally aware countries like Germany still have a negligible proportion of electric trucks and vans on its roads, while other places like Italy have a sizeable proportion of delivery vans powered by natural gas, which is less pollutant than diesel, but still a source of GHG. "We're immensely proud to present the first in a range of fully electrically-powered Volvo trucks ready for regular traffic. With this model we are making it possible for cities that aim for sustainable urban development to benefit from the advantages of electrified truck transports." The company is planning to introduce an electric truck with a gross vehicle weight (GVW) of 16 tonnes, powered by 100-300 kWh Li-ion batteries and capable of delivering 185 kW peak power. Fast DC charging will enable a full charge in under 2 hours. While these numbers clearly tell us that Volvo's trucks are not yet ready for long haulage, it does show interest from a European OEM in being the change agent for the goods delivery industry. China, which controls more than 90% of the world's electric bus market, on the other hand, has not been able to replicate the e-bus success with larger vehicles like trucks. The diagram above shows how, unlike buses, trucks are still diesel-powered for the most part. In China's case, high-end trucks are still dominated by European manufacturers, while cheaper trucks are normally manufactured by local companies. See the IDTechEx Research report Electric Buses 2018-2038 for more. In an industry with wafer-thin margins, fuel efficiency and reduced maintenance could prove to be winning factors in the renewal of an often overlooked industry. Another factor to keep track of is related to driver shortage. In many advanced economies, the truck driver cohort is shrinking, due to long working hours and other socio-economical aspects. While electric trucks alone will not solve that issue, the integration of ADAS features like platooning and self-driving can aid the transportation industry in the continued delivery of goods across the world's highways. The mining industry has already started adopting ADAS features to address its logistics bottlenecks. Find out more in the IDTechEx Research report Electric Vehicles and Autonomous Vehicles in Mining 2018-2028. IDTechEx hopes to see you there to start a discussion on how the transportation industry is changing and how this may impact your business. Find out more and register at http://www.IDTechEx.com/cambridge.